[SatNews] Also known as black smokers, these mini submarine volcanoes spit out hot water up to 400 degrees. A temporary 1.5 Mbps bandwidth increase of Ku-band VSAT for the research vessel Pourquoi pas? (Why not?) enabled the French Research Institute for Exploitation of the Sea, known as Ifremer, to conduct a live video broadcast and conference from the mid-Atlantic during an educational event called ‘Night of the Abyss’. The broadcast event was part of the BICOSE (Biodiversity, Interactions, Connectivity and Symbiosis in Extreme Environments) scientific mission, which took place from January 10th to February 11th. The mission focused on the study of hydrothermal vents in the mid-Atlantic. Also known as black smokers, these mini submarine volcanoes spit out hot water up to 400 degrees. Night of the Abyss linked Pourquoi pas? with two sites in France (Paris and Brest). It began with a presentation of the BICOSE campaign and technical capabilities, and an introduction of the scientific team on-board. 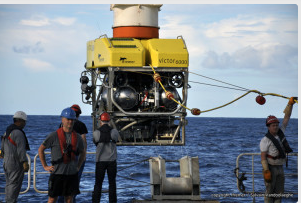 This was followed by a 20-minute commentary broadcast from the Victor 6000 Remote Operated Vehicle (ROV), where the audience discovered the TAG hydrothermal site at a depth of 3600m. The event concluded with a 40-minute interactive question and answer session. “Though the broadcast went without a hitch, the Marlink Network Operations Centre team, including antenna experts and service managers, was on stand-by throughout. This was after being heavily involved in prior testing of the service to ensure its capacity to stream high-quality live video and audio without interruption,” adds Antoine Lisse, Key Account Manager, Marlink. 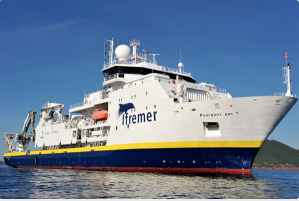 Ifremer, through its research work and expert advice, contributes to knowledge of the oceans and their resources, to monitoring of marine and coastal environments and to the sustainable development of marine activities. The organisation is committed to engaging the wider public in scientific topics regarding the oceans with events like ‘Night of the Abyss’, and a blog and Facebook page for the BICOSE mission.